A mandoline is a must-have kitchen tool. They’re very quick at creating uniform slices of vegetables and cut prep time significantly. 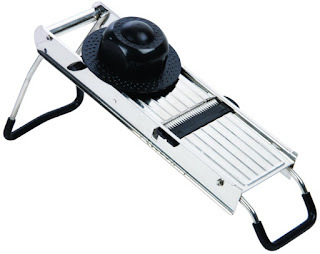 If you find yourself slicing and chopping every day, then it’s time to get your very own mandoline slicer. Fold out the mandoline’s legs (if it has them) and prop them on a clean, flat surface. The mandoline should never wobble or slip and needs to face perpendicular to you. 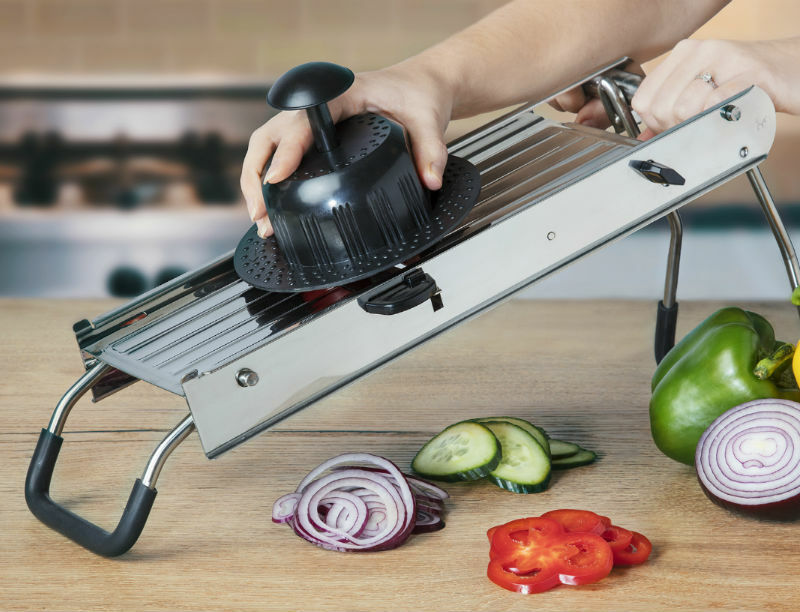 If your mandoline doesn’t have legs make sure you firmly grip the handle and place enough pressure to hold it in place on your worktop. Pushing down and forward gives you the most control so keep the raised end closest to you. The mandoline can only slice a flat surface. So you need to cut the food to start with a flat surface. And you might need to cut your food into smaller pieces to fit inside the hand guard. Juicy food will wet the mandoline’s cutting surface so you don’t have to. But if you’re slicing dry, starchy food like potatoes, then splash the runway with a little water to make slicing easier. Place your food in the hand guard so the flat side faces the cutting surface. Slot the hand guard into the mandoline and make sure you keep your fingers well away from the mandoline’s blade. When you push the food down the runway the blade will cut one slice at a time. Don’t try to rush it and make sure you keep an even pressure to slice at the same thickness. A mandoline makes prepping and slicing ingredients for recipes quick and easy. It doesn’t use electric. There isn’t a thousand little parts to attach. And it’s as sharp (if not sharper) than the very best knives. So what can you use a mandoline slicer for? Most straight blade mandolines come with different types of blades. A julienne blade is your new best friend if you find yourself struggling to slice vegetables into thin matchstick strips. It can take top chefs a long time to perfect their julienne technique, but a mandoline is consistent and accurate from the get-go. As the name suggests, a waffle blade gives you a waffle slice. You’ll find waffle-cut fries are extra crispy as there’s a larger surface area exposed to the cooking oil. The trick to using a waffle blade is to rotate whatever you’re slicing by 90° each time. Just back and forth so the crinkle ridges are perpendicular to the blade’s ridges. It takes a little practice but once you’ve sussed this you’ll get perfect waffles every time. Mandoline’s with a V-shaped blade have two separate blades to push food across. This makes it easier to get even slices with soft foods like tomatoes. But you can’t always change the blades to get different slicing styles. Straight blade mandolines are the most popular and feature changeable blades to get different types of cuts. If you want to get creative with slicing then a mandoline with a variety of blades is the best choice for you. 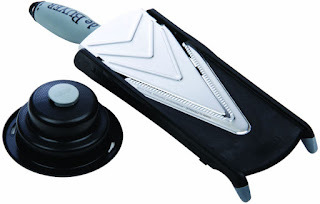 If the blade is adjustable make sure you set it to its lowest setting and wipe the mandoline slicer with a soapy cloth. Wipe from the base of the mandoline to the top to get rid of any leftover food and rinse off the soap under running water. Dry the mandoline thoroughly and carefully with a tea towel or leave on the draining board to air dry. The mandoline needs to be bone dry as storing it wet can lead to rust. Some mandolines are dishwasher safe and its instructions will tell you if this is the case. We’d recommend hand washing as it’s gentler on the blade. Find this interesting? 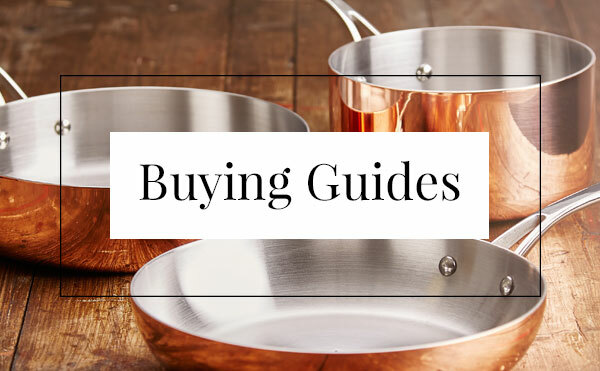 Check out our Buying Guides and How To's page to get inside knowledge of the chef world. Follow our Home Chef Facebook page to keep up to date with the latest product launches and offers.